We all have stuff lying around that we don’t need, much of which ends up in that electronics graveyard formerly known as one of our closets. Studies show that most people have between $1,000-$2,000 worth of items just lying around gathering dust. But who wants to bother with selling these items online? There’s the effort of listing, answering emails, dealing with seller ratings, payment issues and (ugh!) shipping. 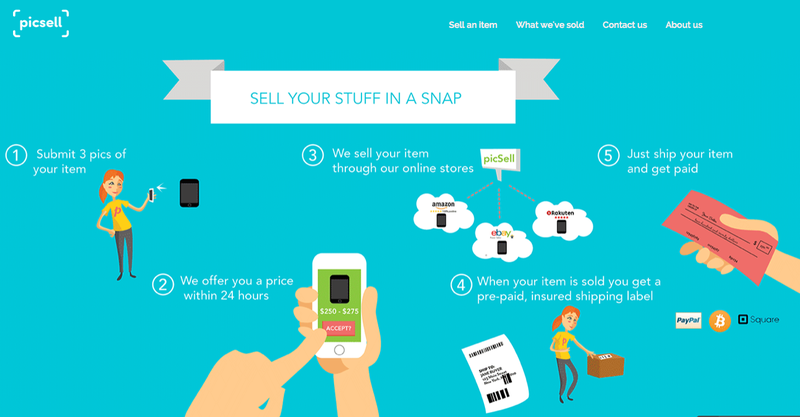 PicSell makes selling that stuff on line as simple as taking a picture. Users send picSell three photos of the item they wish to sell, specify the brand and model, email the information to picSell and the company sells it at the highest price. That’s because they have a super-seller rating on multiple marketplaces, including eBay, Amazon, Etsy and Rakuten. Once it sells, picSell sends sellers a pre-paid, insured shipping label for pickup or drop off. Then they pay up. It’s simple, anonymous and profitable. No other service offers such a streamlined, minimal selling process: it all takes under a minute. Founded in October, the company didn’t officially launch until they got to DreamIt and so far, so good. Electronics are big sellers – particularly smartphones – but they’ve also sold everything from spinning bikes to a kitchen range to faucets. The site is particular popular – so far – with people who are moving and have items to get rid of (one happy customer paid for the move by selling on the picSell platform, Almagor told us). And with interior designers, who often buy more than they need, or have clients who change their minds about certain items. Some of the items on picSell are actually new. “We sell anything that’s shippable,” said Almagor. And they take a percentage of each item sold. Amazing what you can do now with just a few, well, picsells.